Please feel free to contact us if you have any comments or questions. We are happy to help you plan your vacation and answer any questions you might have about the River Dance Lodge. East of Kooskia on Highway 12 in Syringa, Idaho. Get Driving Directions to the River Dance Lodge. If you are interested in a shuttle service from Lewiston, visit this website. Below you'll find all of the packages we have ready for our guests. Custom Packages - We are masters at building custom vacation packages! So if one of the packages below do not work for you, contact us and let us build something together! Request a FREE brochure from River Dance Lodge and from ROW Adventures to help you plan the dream vacation you've been longing for! Please fill out the form below and click the link if you would like to subscribe to our newsletter. "Thanks for a wonderful time. The cabins were just beautiful, and the view was spectacular. Would love to come back!" "A wonderful and relaxing weekend with the family. Great scenery, soothing hot tub, wild cutthroat trout, and a cozy cabin. We'll definitely be back...can't wait." Copyright 1979 - 2019 River Dance Lodge. Our hope is that your first stay at River Dance Lodge is just one of many. Thus our goal is to provide thorough and complete communications and be clear with the details of our agreement with you. Because the fine print sometimes changes, you will receive the most current Terms & Conditions along with your travel documents at the time of booking. We do our best to provide you with all kinds of great resources to prepare you for your stay and for any activities you participate in during this time. These include packing lists, reading lists, detailed itineraries and more. We welcome all ages at River Dance Lodge. Most of the available activities are suitable for beginners ages 5 and up, except for rafting trips on the Lochsa River which has special age and ability requirements. As well, some are more active than others. It’s important that you understand the physical requirements for whatever activity you choose. If you’re unsure about the requirements, please call for advice from our Adventure Consultants. Be sure to read the “Trip Member’s Responsibility” below and if you have any medical concerns be sure you speak to your doctor and inform us. When we confirm the availability of your desired accommodations and/or adventure, we will send you a reservation packet including a suggested packing list and detailed invoice. Final balances are due 30 days prior to departure. We reserve the right to cancel your reservation if full payment is not received by the due date. We accept all major credit cards, personal checks or money orders for trip payments. Prices are plus 8% Idaho taxes. Reservations made more than 30 days prior to departure require a deposit which is due upon booking (however demand for space sometimes requires us to request payment in less time). Reservations made less than 30 days prior to departure require immediate payment of the full balance. You will need to complete and sign a “Participant Agreement and Assumption of Risk” prior to participating in any activities during your stay. While it is often possible to join one of our trips on short notice, space is limited and we recommend you sign up well in advance. Check-in is at 4pm. Check-out is 10am. Daily maid service is provided as desired. A security deposit is required for each unit and will be collected at check-in. We accept Visa, MasterCard, Discover or American Express. If we discover any damage or missing items we will prepare a written estimate which will be forwarded to you and your credit card will be charged the full amount of the repair or replacement cost. All units are non-smoking. If we find that your unit has been smoked in, an additional $200 per unit, per day will be charged to the credit card used for your security deposit. Children under age 12 stay free in our accommodations. This does not apply to packages. There are no phones or televisions in the cabins or tents. We do have a public phone accessed with calling cards, and wireless internet available at our on-site restaurant, Syringa Café. There is NO cell phone coverage in the area. From mid-May to early September we have a two-night minimum stay on weekends for cabins. Specific dates vary. One night stays are welcome any time in our glamping tents. However, if you are booking within 7 days and we still have availability, we will accept reservations for a one-night weekend stay in our cabins. We have one small cabin and one large cabin where we allow two well-behaved pets per unit. There is a $15 per night pet fee and a $75 damage/cleaning deposit required at the time of check-in. Pets may not be left unattended. Please note that ROW Inc. and River Dance Lodge, LLC are separate companies. Your cabin rentals at the River Dance Lodge and your river trip with ROW Adventures have separate cancellation policies EVEN if booked on the same reservation. So if, for example, high water prevented ROW Adventures from running a trip as planned, River Dance Lodge’s cancellation policy regarding your cabin reservations still apply. See below for more information. Cancellation Policy - Lodging Only: If you find it necessary to cancel your trip, please notify us as soon as possible. If notification of cancellation is received (call to verify) 30 or more days in advance of reservation, you will receive a refund less a $20/night cancellation fee. No refunds for cancellations less than 30 days. Sorry, no refund given for late arrival or early departure. Please understand that once you've signed up, we lose the right to sell your reserved space to other individuals or groups. We do not “overbook” like the airlines. Therefore, we regret that we cannot make exceptions for personal emergencies. For this reason we strongly recommend you consider purchasing a travel protection plan (see below). Cancellations for Packages (Lodging with Meals or Activities): If you find it necessary to cancel your trip, please notify us as soon as possible. If notification of cancellation is received (call to verify) 30 or more days in advance of reservation, you will receive a refund less the amount of deposit. Deposits are non-refundable. No refunds for cancellations less than 30 days. Sorry, no refund given for late arrival or early departure. Please understand that once you've signed up, we lose the right to sell your reserved space to other individuals or groups. We do not “overbook” like the airlines. Therefore, we regret that we cannot make exceptions for personal emergencies. For this reason we strongly recommend you consider purchasing a travel protection plan (see below). Cancellations Caused by Non-Performance of ROW: If any “activity” is modified (as explained below under “Non-Performance”) or an “activity” is cancelled by ROW, and you have cabin reservations with River Dance Lodge, whether or not associated with a “package” then the respective cancellation policy of each company will apply. In other words, while ROW may provide a rain check, substitute trip, partial or full refund, River Dance Lodge’s cancellation policy regarding cabin reservations will still apply. For example, if high water prevented ROW Adventures from operating a river trip as planned, River Dance Lodge’s cancellation policy would still apply for the cabin portion of your reservation. Cancellation Policy: If you find it necessary to cancel your trip, please notify us as soon as possible. If notification of cancellation is received (call to verify) 30 or more days in advance of reservation, you will receive a refund less the amount of deposit. Deposits are non-refundable. No refunds for cancellations less than 30 days. Please understand that once you’ve signed up, we lose the right to sell your reserved spaces to other individuals or groups. Therefore, we regret that we cannot make exceptions for personal emergencies. For this reason we a strongly recommend you consider purchasing a travel protection plan (see below). Non-Performance: We do our very best to run all trips as planned. However, we reserve the right to cancel a trip or make changes in the itinerary, including moving to a different river or river segment, in the event of circumstances beyond our control including, but not limited to, extreme water conditions (including high or low water), forest fires, road closures, or insufficient sign-ups. If we are not able to provide a substitute trip, river or altered itinerary and have to cancel the departure completely, a full refund will be given. This refund is limited to the amount actually paid to ROW, Inc. Travel expenses, airline tickets or any money not paid directly to ROW will not be compensated. We offer a comprehensive cancellation and trip protection plan through our office and recommend this coverage which protects your payments if you have to cancel for medical or other covered reasons. A benefit now offered by Travel Insured International is “Cancel for Any Reason Upgrade” or “Cancel for Work Reasons Upgrade”. These are great options for anyone uncertain of their travel or work plans. Children ages 17 and under (traveling with a covered adult) are free! 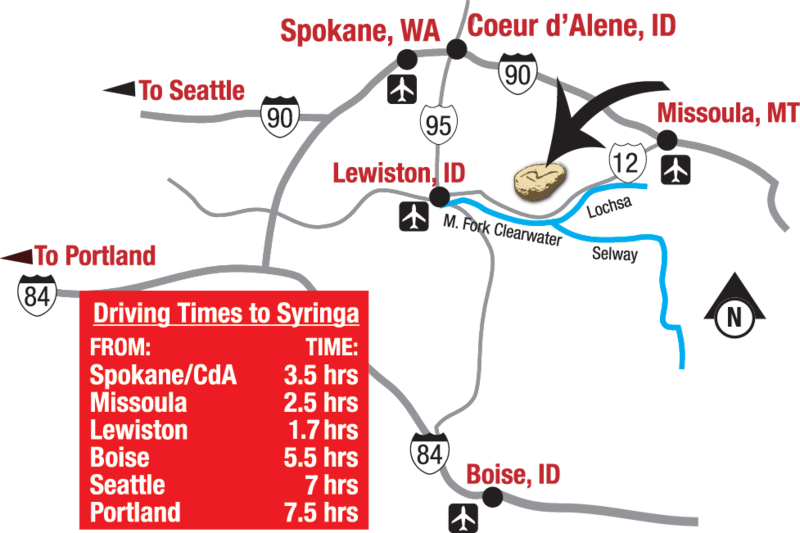 The Syringa Café is our on-site restaurant offering the best of the northwest culinary scene. The café is open daily from early May through August; closed Tuesday & Wednesday during the month of September. Breakfast is served 8:00 am to 9:30 am as a continental buffet or breakfast basket. Reservations required at least 24 hours in advance. Lunch is served from 11am until 3pm. Walk-ins are welcome. Lunches are provided on all daily activities or box lunches may be ordered in advance for independent adventures. Dinner is served from 6pm to 8pm. Walk-ins are welcome. We have an extensive wine list and beer in bottles and on tap. Gluten free and vegetarian options available. Trip members have the responsibility to select an accommodation, package or trip appropriate to their abilities and interests. We are happy to discuss the options with you if you have any questions or concerns. Trip Members are held responsible for being in sufficient good health to undertake the trip. Members are also responsible for studying all pre-departure information; for bringing the appropriate clothing and equipment as detailed therein and, for acting in a manner considerate of fellow group members. If you are participating in a guided activity and you are a person who is diabetic, epileptic, or asthmatic or has a history of heart trouble, is allergic to bee/scorpion stings or takes daily prescription drugs should include this information on the trip application form or inform our office. Trip members will also alert their guide (s) of any medical history that could become a problem on the trip. People with a history of heart trouble, pregnant women or any other potentially serious medical condition should consult their doctor before coming on a trip. River Dance Lodge and ROW Adventures reserve the right to disqualify anyone at any time before or during the trip for medical or psychological reasons. Each trip member is ultimately responsible for his or her own medical expenses. We cannot refund costs of medical examinations or other expenses incurred while preparing for a trip. If you arrive at the start of your trip with a pre-existing condition or injury that was not disclosed in writing to ROW Adventures and you are subsequently forced to leave the trip because of this condition, you will be charged all extra evacuation expenses and will not receive a refund of any unused trip services. All health information is treated as confidential. Payment of your deposit represents your acceptance of the following conditions: River Dance Lodge, LLC and ROW Inc. (dba ROW Adventures), its subsidiaries and cooperating agencies act only in the capacity of agents for the participants in all matters relating to transportation and/or all other related travel services, and assume no responsibility or liability whatsoever for any delay, expense, mishap, inconvenience, bodily injury or death, loss or damage to person or property, however caused, in connection with any service, including, but not limited to, that resulting directly or indirectly from acts of God, detention, irregularity, annoyance, delays and expenses arising from strikes, theft, quarantine, pilferage, force majeure, failure of any means of conveyance to arrive or depart as scheduled, government restrictions or regulations, civil disturbances, and discrepancies or changes in transit over which we have no control. River Dance Lodge and ROW Adventures reserve the right, either prior to or after departure, in its good-faith discretion and in circumstances that warrant it, to change or re-price any tour, trip, or expedition. This includes the possibility of moving to a different accommodation, river or river segment due to extreme water conditions, forest fires, road closures and/or acts of God. If we are not able to provide a substitute trip, river, or altered itinerary and have to cancel the departure completely, you will be refunded in full. Refunds are limited to the amount actually paid to River Dance Lodge and ROW Adventures. River Dance Lodge and ROW Adventures reserve the right to take photographic or film records of any of our trips and may use any such records for promotional and/or commercial purposes. River Dance Lodge and ROW Adventures shall not be liable for (a) expenses such as additional accommodation nights and meals not specified in the individual trip itineraries, but which may be required to get to and from a trip start or end; (b) expenses due to the delay of a trip for any reason (e.g. bad weather, trail conditions, landslides, flooding, sickness, etc. ); (c) expenses incurred in recovering luggage lost by airlines, belongings left behind on a trip or in shipping purchases or other goods home. ROW Inc., dba ROW Adventures, is proud to be an Equal Opportunity recreation service provider under separate permits from the U.S. Forest Service, Bureau of Land Management, Idaho and Washington State Parks, Kootenai County and other agencies. These permits allow us to provide services and access to some of America’s most astounding resources that might otherwise be inaccessible to most members of the public. ROW Inc. operates under special use permits granted by the Bureau of Land Management: Cottonwood and Coeur d’Alene Resource Areas. We operate under a special use permit granted by the U.S. National Forest Service on the: Clearwater and Panhandle National Forests. All our operations and facilities are operated on a non-discriminatory basis. ROW Inc. is bonded and fully licensed by the states of Idaho, Washington, Montana and Oregon. We are members of: America Outdoors, Idaho Outfitters and Guides Association and many other effective organizations.